Did Michelle Obama Borrow Her Olympics Look From Kate Middleton? Michelle Obama looked gorgeous at the Olympic opening ceremonies yesterday, but that's hardly news, is it now? There's no point in going to London if you're not gonna catch a bit of the ol' Brit fever, and it looks like MO has done just that. Her beaded, pearly white ensemble isn't exactly unusual for her, but it does look suspiciously like something our favorite princess duchess, Kate Middleton would adore. We really, really love the idea that the two of them had a powwow the night before, swapping outfit strategy at some kind of government-sponsored girl's night in, but it's perhaps possibly more likely that the FLOTUS just wanted to honor the duchess' modern-Brit style aesthetic. And honor it she did – the modest pumps, the low-waisted cut, and the prim white beading on her J. Mendel dress are pure Kate, if you ask us. 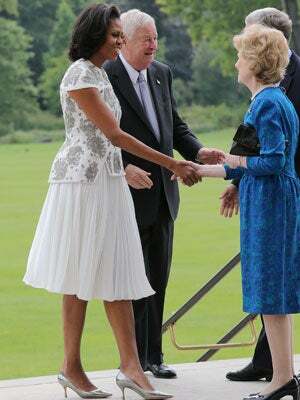 What do you think, though — is Michelle channeling Kate, or has it been the other way around all along? Photo: Courtesy of J. Mendel.